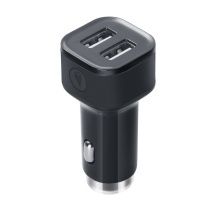 2 in 1: Car Charger integrated with cigarette lighter. Exquisite and lightweight, easy to carry. One button design. It is convenient for you to light a cigarette outdoor by pressing and hold the button. The cigarette lighter can be used for about 40 times for lighting cigarette in a single charge. Dual USB port can charge two electric devices at the same time. Widely used for ipads, cell phones, most GPS units, MP3 players and so on.